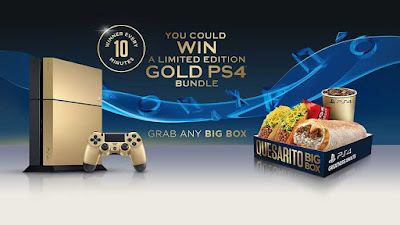 Today Sony and Taco Bell kick off their Gold PS4 promotion to celebrate PlayStation's 20th anniversary. This exclusive offer will give gamers the opportunity to win a Limited Edition PS4 prize pack including a Gold PlayStation 4 and Dual Shock controller, the Uncharted Collection and a year subscription to PlayStation Plus. All you have to do for a chance at the prize is head to any participating Taco Bell and order yourself a Big Box. With this you'll receive a unique code that you can then enter at WinPS4Bundle.com to see if you've won. Sony is giving away a Gold PS4 every ten minutes so there will be more than enough chance to win, especially with the promotion running until November 4th. Check out the official announcement here. The minute I saw this I wanted it. 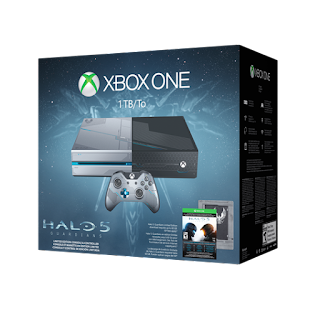 So if I have to eat Taco Bell Big Boxes for the next few weeks and hope to get one, I will. Fingers crossed. Hello there, if you're reading this you've probably noticed that I haven't done a posting in quite some time. There's a reason for that. Let me explain. You see over the past few months I've been busy, with a lot of different things. So much so that I haven't been able to sit down and write a blog post or even put a few hours towards my favorite game(s). For starters I moved into a new position at work with a lot more responsibility and workload. Right after that I started looking into a new house while trying to release a Sci-Fi book I wrote and plan my upcoming wedding. I'm now have my own place with two weeks remaining for said wedding. Most would say that's quite a lot and yes I would agree but I wouldn't change anything that's happened in the past few months.